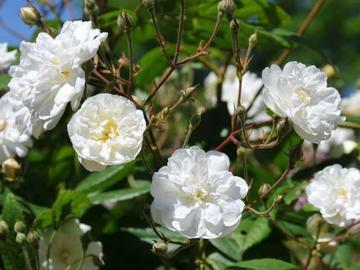 English shrub rose producing open sprays of small double, pure white flowers, on wiry stems, repeating throughout summer. Lightly fragrant. Light to mid green foliage with narrow, widely spaced leaflets. Loose, arching habit or can be trained as a short climber. Bred by David Austin Roses, introduced 1988.